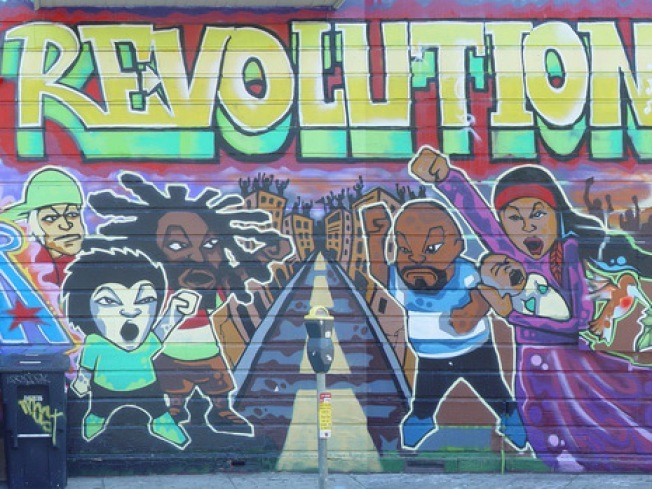 CUBA and SPIE's "Revolution" may have been painted over on accident by Sirron Norris, but now the artists are working together. A dispute over a mural at San Francisco's Bartlett and 22nd streets in San Francisco's gaily painted Mission District has been resolved, with at worst some hurt feelings. Sirron Norris was asked to paint a mural on the wall of the Revolution Café as part of a benefit for the Mission Neighborhood Market, and happily volunteered. Unfortunately, no one told Norris that the artists behind the existing mural hadn't been informed. So in a tense moment last weekend, Eric "Spie" Norberg, who contributed to the original, made his feelings known to the interns who were working on the new piece at the time. Later, "No Culture Vulture" was sprayed over the work in progress. When Norris finally heard about the altercation, he reached out to Spie and Cuba, the original artist. He also wrote a letter of apology to the neighborhood. "With sincere humbleness, I meant no harm to the community for which I have grown to love over the past 14 years." Norris and Cuba have promised to work together on a new piece, which hopefully will be done in time for the party on June 19th. Jackson West loves it when we can all get along.